The fight for patient care continued to escalate at Kaiser local bargaining this week. 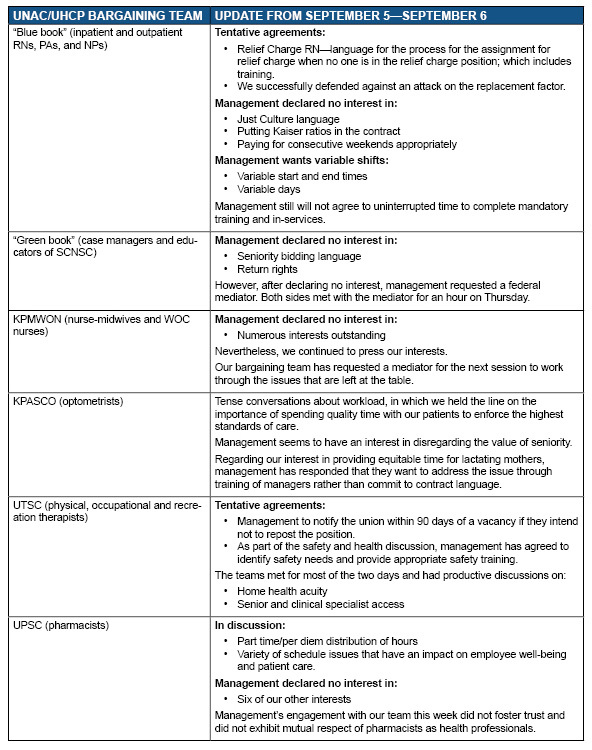 Under pressure from the blue book team, management declared they have no interest in just culture language, or in putting their own agreement on Kaiser staffing ratios in the contract. This makes the fight clear—we are fighting for patient care and a learning culture which protects the safety of patients and health care professionals. Management is in full retreat from those values. At nearly every bargaining table, we pushed our interests in language and practices that would improve patient care or held the line against management’s interests which put affordability before care standards and flexibility above the values of partnership. “Basically, it comes down to money versus patient care,” said Rob Jones, RN. It’s time to remind management once again that we stand strong together and will do whatever it takes to protect our patients. Come out to local bargaining next Wednesday, September 12 at the Glendale Hilton. Sign up here. It was Kaiser San Diego’s turn to wear “Ask Me About Staffing” stickers in both hospitals, their clinics and MOBs on Labor Day, to highlight chronic staffing problems and the need to move already agreed-upon Kaiser ratios into our contract. Our final scheduled date for local bargaining is next Wednesday, September 12, in Glendale. What’s needed now is another strong showing by members. “We need you to come to local bargaining in Glendale,” said Bianka Tulgar, PT, “So that you can really let management know that you are behind us, you are with the union, and that you want the best contract.